May is Labor History Month. Looking back at our own history, AFGE has much to be proud of. From winning the right to negotiate collectively to successfully curbing the tide of privatization, we have been a strong voice for public servants for decades. Lately, powerful special interests and their mouthpieces in Congress are determined to crush government employees, gut their voice at work, and tip the scale in favor of the wealthy. Thanks to a Supreme Court decision that allows big corporations to pour unlimited money into politics, threats to public servants have become more extreme. And now, special interests have set their sights firmly on AFGE. They may succeed unless our members stand strong together. 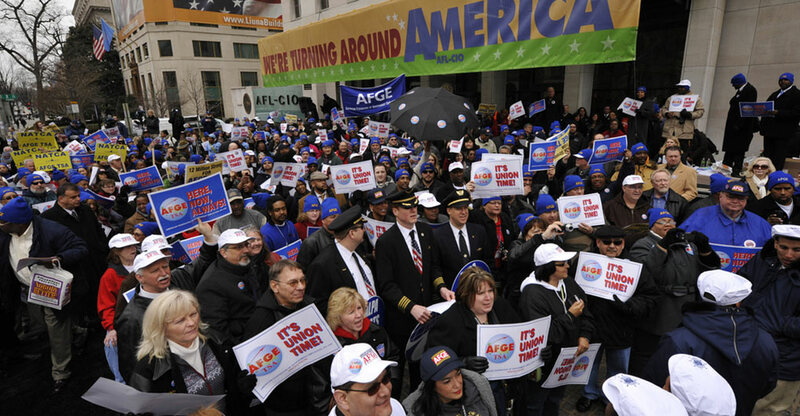 Generations of AFGE leaders have steered the union toward the success we’re seeing today. The baton has been passed to a new generation of leaders. A few years ago, workers responded to new threats with the Big Enough to Win plan – a vision with concrete goals that propelled us to 300,000 members and set the stage for even bigger successes down the road. Next month, hundreds of AFGE leaders and activists will gather in Philadelphia to fine-tune our strategy and begin to write the next chapter of our history. Eighty-four years ago, a group of federal employees set out to take on one of the most challenging tasks in their lives – standing up a new organization to secure workplace protections at a time when pay cuts and furloughs were the rule. That was in 1932, one of the worst years of the Great Depression. AFGE founders knew it would not be easy, but it was unquestionably a time when action and aggressive leadership were most needed. They soon made their presence felt. The founders called for restoration of pay for federal employees at the time when everybody said it couldn’t be done. They boldly pushed forward anyway. When public servants’ pay was restored, employees in the private sector received a similar pay raise. The united action of civil servants was a tide that lifted all boats. As AFGE gained greater support from the AFL-CIO, federal employees gained greater respect from President John F. Kennedy. -A telegraph sent by President Kennedy the day after his inauguration in 1961. 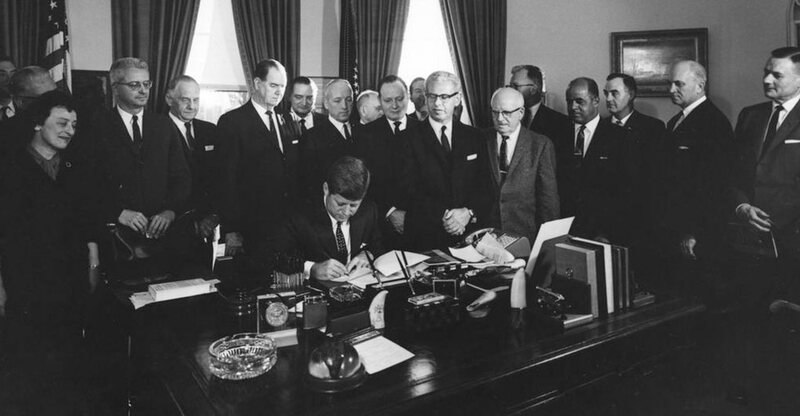 In 1962, JFK issued an executive order in 1962 to establish rules and methods to empower the voices of federal employees. It was a significant victory for public servants and the public they served. Through our members' unfailing activism, retirement benefits were increased, the government began paying a portion of health benefits for workers and their families, and legislation was passed reforming the pay system. Under the leadership of John Sturdivant, we fought a restrictive bill that prohibited federal employees from participating in the political process even on their own time and away from the workplace. The 1993 Hatch Act Reform bill removed that prohibition, allowing federal employees to express their political views just like any American when they are not on duty. Faced with downsizing, AFGE fought and won buyout payments of up to $25,000, continued health care coverage and other job training opportunities for employees. The $25,000 buyout would later serve as a model for civilian federal agencies facing reorganizing and downsizing. 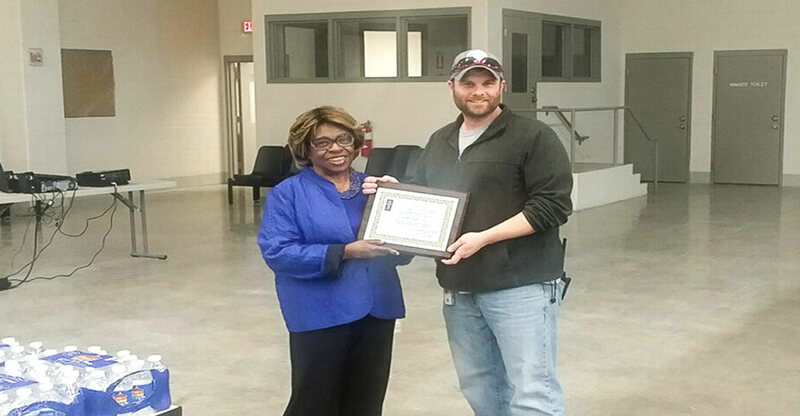 Despite ongoing base closures and increased contracting out, which caused federal employment to drop by 100,000 jobs, AFGE membership surged dramatically as a result of various new organizing programs. To survive, we had to find ways to reorganize our union to better respond to new challenges. Public servants' positions have often been targeted by for-profit corporations looking to make profits off of government work. Under the leadership of Bobby Harnage, AFGE fought tooth and nail against President George W. Bush’s plan to hand over 850,000 federal jobs to private businesses. It took years of united effort to win the battle, but ultimately a ban was put in place on the process of shipping public dollars to corporate coffers. Before 9/11, airport security was handled on an airport-by-airport basis, with for-profit staffing companies handling the screening process. Following the devastating attacks on 9/11, AFGE fought to ensure that airport screening functions were made consistent and reliable under the federal government. Although security was federalized, employees were not allowed to have a voice at work. In the face of massive resistance from the Bush Administration, AFGE boldly united workers at the first TSA local in 2003 with 13 charter members from across the country. The local grew, and now we represent 45,000 TSA officers. Against the backdrop of hostility in Congress and their misinformation campaign against public servants, AFGE broke the membership record of 300,000 members under the leadership of J. David Cox Sr. We continue to successfully keep the ban on outsourcing, obtained locality pay increases for employees in over a dozen more cities, and secured health care coverage for the most effective treatment for autism spectrum disorders. Throughout our history, we have proven that our most effective weapon against these threats is standing united. There is strength in numbers. When we refuse to give up and put our best thinking to the table, we win. That’s why AFGE leaders stepped up our game when hostile members of Congress furloughed federal employees and shut down the government in 2013. On the eve of the government lockout, they gathered in Orlando and created a new vision for the union. AFGE’s Big Enough to Win strategic plan was designed to empower AFGE by strengthening every local, growing our membership, building our legislative power, and training and engaging members on all media platforms. At AFGE’s 40th Convention in August 2015, AFGE delegates endorsed funding for key pieces of Big Enough to Win. However, the work is not yet complete. 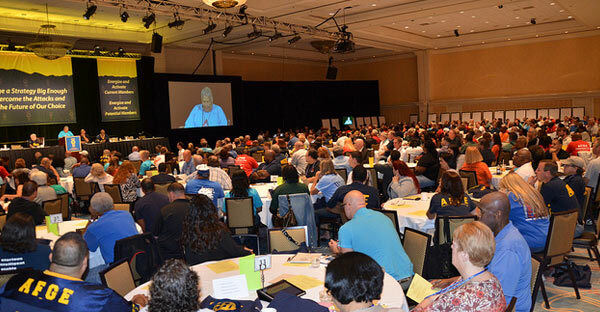 At the National Leadership Meeting in Philadelphia next month, members will assess and strengthen the progress of the Big Enough to Win plan, share best practices across all levels of the union, and unite through our shared values. From the efforts to win the right to negotiate collectively to the fight for fair compensation and against outsourcing, federal employees have been through it all. We seek a good future where government is valued , employees are fairly paid, and the important missions are properly funded. There are serious challenges as the special interests and their allies in Congress won’t stop the onslaught any time soon, but intend to win. Labor History Month serves a reminder that we as a union of working people serving the American people will determine our own future and write our own history. Tell your story on social media about why workplace rights are important to you and tag @afgeunion (Facebook) or @afgenational (Twitter) so we can share your story. Attend a pro-working people, pro-democracy rally in your community to show your support.